"Around here, however, we don't look backwards for very long. We keep moving forward, opening up new doors and doing new things...and curiosity keeps leading us down new paths." I was going to write a nice little piece about the new artwork released today detailing the quick service restaurant coming to the new Toy Story Land in Hollywood Studios. I even had the photo saved and the article I was going to reference pulled up. Then I saw this. It's in Cosmopolitan Magazine (which my friend says is "the first hint that it's crap") but was written by the editors of Redbook. And it really IS crap. But it's worse than that. It's truly racist. Let me explain. The Redbook editors are using the cultural appropriation argument here. 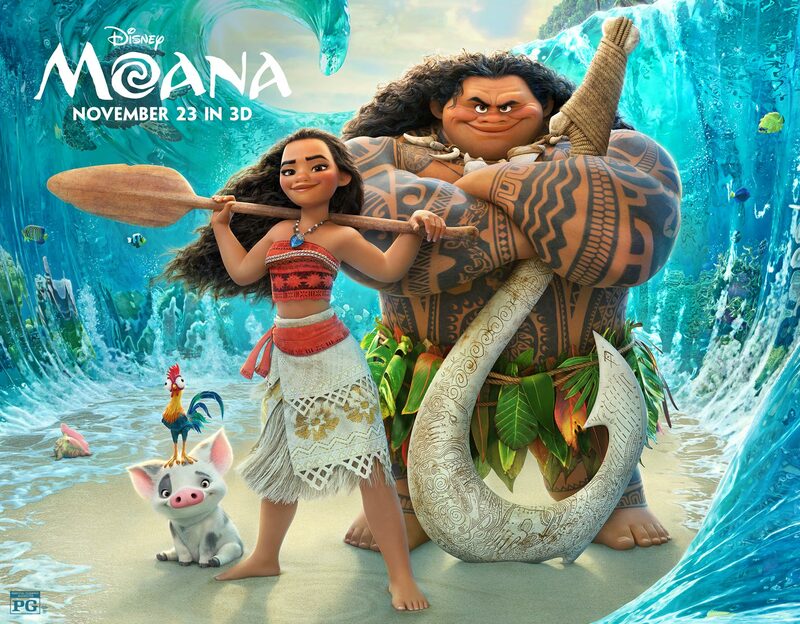 They say that since Moana is a Pacific Islander no one but other Pacific Islanders should be able to dress up like her, or wear things meant to mimic or evoke the whole Pacific Islander motif. They reference an article on another website written by a mom who was worried that her daughter's preference for either an Elsa or Moana costume left her to choose between reinforcing "white privilege" (Elsa) or cultural appropriation. She clearly thinks the later is much worse. The argument is that dressing up in another culture's traditional garb is making fun of that culture, like wearing blackface was a way for white actors to make fun of African Americans. But kids' Halloween costumes aren't blackface. More importantly, kids aren't racist. Unless they are taught to be, kids just don't see things that way. And that is where the problem lies. Children want to dress as Moana because they admire her. She's strong and smart and independent, so this is a good thing.....in the sane world. When you tell your child that dressing as a person from another culture is wrong, you are planting the seeds of racism. You are teaching your child that superficial differences (like skin pigmentation and the latitude and longitude of your birthplace) are more important than the qualities (like courage and resourcefulness and independence) that your child admires in her heroine. You are, in essence, quoting the standard White Supremacist dogma and that makes you a bad parent. And, if I might add, a bad person. Lately Disney has done a great job making the Princesses in its movies much more than just pretty faces. They have given us warriors and leaders and heroes for our daughters to admire. They have drawn on the rich traditions of Ireland and Norway and China and Polynesia and our own New Orleans to create stories that speak to all of us, that show us that heroes can look like anyone and can come from anywhere. To try to reverse that progress with holier than thou, wrong-headed, ignorant and small-minded virtue signalling is horrible. So Epcot just turned 35 and is in need of some love. The festivals have been great, but Future World is a shadow of its former self and the World Showcase hasn't seen a new pavilion in many moons. The Walt Disney top brass has promised a huge investment in Epcot over the next several years, big to the tune of billions of dollars, but has been pretty vague about the specific plans. As far as World Showcase is concerned we are to get a new Ratatouille attraction in France for sure, but nothing else has been confirmed. This has left the rumor mills turning at full tilt. Two new national pavilions have been rumored to be pretty safe bets, Spain and Brazil. But Spain was to include a ride based on Gigantic, a planned re-telling of the Jack and the Beanstalk story set in Spain, and Gigantic has been scuttled. Will Spain survive? An article I read a couple days ago (and I can't for the life of me remember what blog posted it) says no. This is a bit of a bummer from the perspective of wanting more countries represented, but it leaves money in the budget for other things, and those things are interesting. Brazil is apparently on track, but will not feature an attraction. Its big draw will be a Brazilian Steakhouse, which is fine by me. The problem this leaves, because of the loss of Spain, is one of crowd flow/control. Disney Imagineers want an attraction in the space between Norway's Frozen and France's Ratatouille and that was to be Spain's Gigantic. Now they are looking at existing pavilions in which to build a ride and Japan has risen to the top of the list. One option is a Matterhorn-style coaster based upon Mt. Fuji. This was part of the original plan for the Japan pavilion so it stands to reason it's still on the board. But the other option is the one I'm excited for. Big Hero 6! Big Hero 6 did well in theatres, the meet and greet with Baymax is popular and the franchise has a new cartoon on the Disney XD channel that is also performing well. The characters tie in well with Japan. I think it's a winner. LEt's see if the Imagineers think the same thing! OK, so I missed my second, MY SECOND, post of this series. I'm a mess. But you want to know what really made me a mess? Reading this article about a foster mom's attempt to bring joy into her new daughter's life. I enjoyed the blog-post-a-day for the final 100 days of my last Disney countdown, so I'm going to give it another try! Today is double-digit day, a momentous occasion to be sure. I think I'll celebrate by purchasing tickets to the Secrets of the Empire hyper-reality experience for the Saturday we'll be down there. I was looking on the sales website and one of the time slots is already sold. Now, there are A LOT of time slots, they book every 15 minutes, but still I don't want any surprises. Finally have a Disney Countdown again. Lately I'm just not....right....without concrete plans for visiting my Happy Place. But now I have reservations and tickets and all is right in the world. We'll be taking another long weekend with just the lovely Lisa and I and, as usual, we'll be trying out a few firsts. Well, one is a first for Lisa but just a "been a LONG time" for me. We'll be tent camping at Fort Wilderness. It'll be late January, so it won't be hot and fingers crossed it won't be too cold. The usual weather for that weekend is highs in the 70s and lows in the 50s, so I am pretty confident we'll be comfortable. Our gear is rated for below freezing, so I'm not worried about sleeping at all. In any case, we'll have fun. I'm very excited to introduce Lisa to the camping thing, especially in The Fort. This will actually be Lisa's second time at Fort Wilderness, but the first was a stay in the Wilderness Cabins with my family as a graduation from college gift from my folks (who, by the way, are THE BEST for doing that). Another first for us will be attending the Disney After Hours event. We will likely leave here after work Thursday and drive most of the way down, planning to finish our trip and get to WDW around lunch time Friday. The After Hours event allows you entry to the Magic Kingdom at 7 pm with three hours in the park after it closes to the public at 8:00 and our tickets are for Friday night. From everything I've heard this is a pretty incredible time. They only sell a few thousand tickets which leaves the park pretty much empty. The attractions are almost all open and according to a friend who did this last year, they are all walk-ons all night. As an added bonus, popcorn, ice cream snacks and drinks are complimentary all night. I'm looking for forward to seeing this for myself! 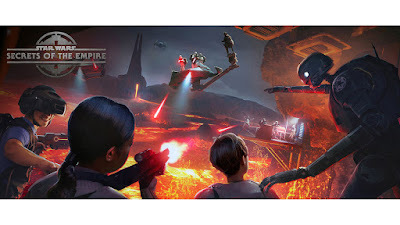 We're planning to spend Saturday at Disney Springs enjoying the food and cocktails and shopping and hopefully experiencing the immersive, virtual reality Star Wars experience that is scheduled to open by the end of this year. Called Secrets of the Empire and created by a company called The Void (who've also created a similar experience themed after the Ghostbusters in New York City) the experience will transport you into a Star Wars universe you can touch and interact with during an original story. It's not like anything I've ever done and I am itching to try it out. With any luck The Edison will be open in Disney Springs by then along with it's underground component. That underground bar was originally rumored to be a Neverland-themed secret kind of Lost Boys lair thing but now is supposedly going to be modeled after rum running tunnels that presumably fit well into the Disney Springs backstory. We'll see. The whole thing sounds right up our alley, so I'm hoping the Fall 2017 opening projection means it will be ready by late January. Day Two was to be book ended by scheduled events. We had tickets for the One World Observatory, the top of Freedom Tower which replaced the World Trade Center, at 9 am, the first group to ascend. We also had tickets for an 8:00 pm show of Phantom of the Opera. These were two things that were on our "must-do" list and we were happy to sacrifice spontaneity to be sure we had tickets. I picked the earliest tickets for One World that I could thinking it would be cool to see the city from way up there before we delved into exploring it. Also, I hoped it wouldn't be too crowded. Both were correct. My one fear was hitting rush hour on our first attempt at using the subway, but that turned out not to be a problem. I'm not sure why, but the train was nearly empty and neither station was particularly crowded. I'm really happy with our subway experience. I downloaded a map of the system into my phone and referenced that quite a bit both during our visit and for weeks leading up to it. It is complicated and there are multiple colors and shapes and letters and numbers used to designate a ton of lines, but we managed it well and made great use of the subways during our trip. For our first trip this particular morning we rode the "E" train to it's last stop at the World Trade Center, which let us off between a very old church and one of the most modern buildings I've ever seen. That was cool, and a bit weird. Between us and the tower was a funky thing called the Occulus, which is, best as we could tell, an underground shopping mall. The above ground portion is very striking, though, architecturally. 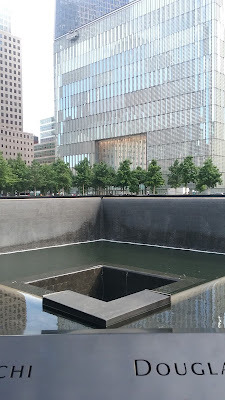 On the advice of a security guard, we didn't travel below ground but instead crossed the plaza to the 9/11 Memorial. The memorial is really impactful in a bit of an understated way, if that makes sense. 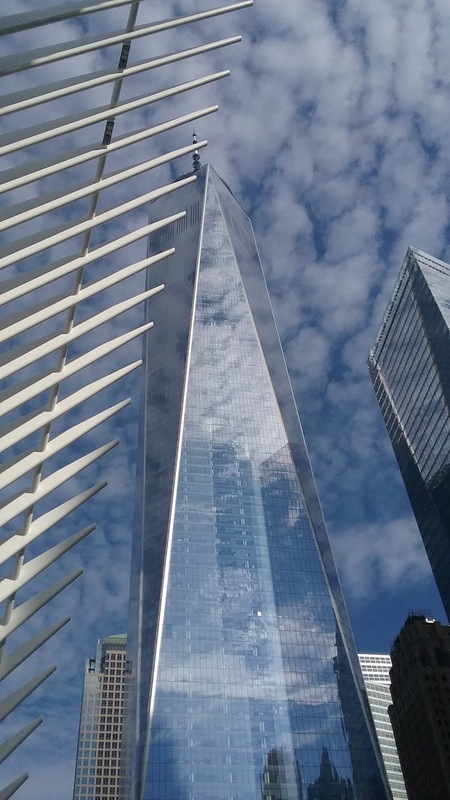 The One World Tower sits right next to the memorial and takes the job of soaring into the heavens (and, I guess, metaphorically the future) onto itself. It's huge and shiny and reflective and majestic. 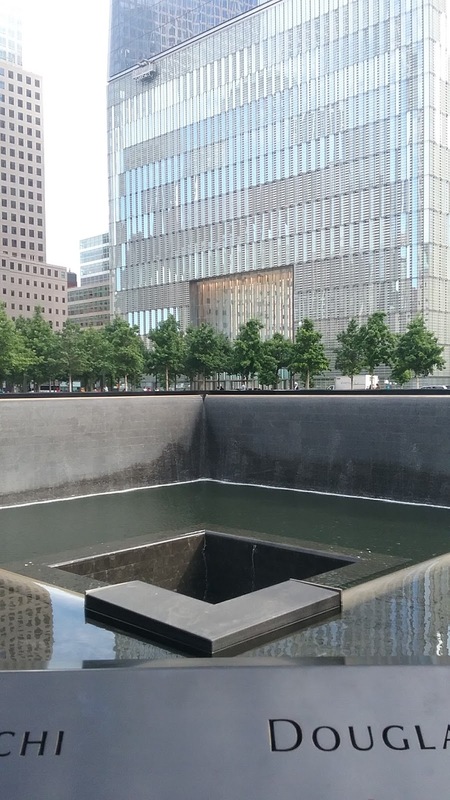 The memorial, on the other hand, is a pair of holes where the old Twin Towers once stood. Water fills the hole disappearing into a well that has no bottom we can see. It's the opposite of the tower. Names of those killed are etched into the walls surrounding the pits. It's a somber sight, to be sure. But what made me most sad, and most reminded of how the world has changed, were the police armed with shotguns and assault rifles and the police with the Anti-Terrorism patches on their uniforms. It struck me that John found none of that odd, and that's sad. 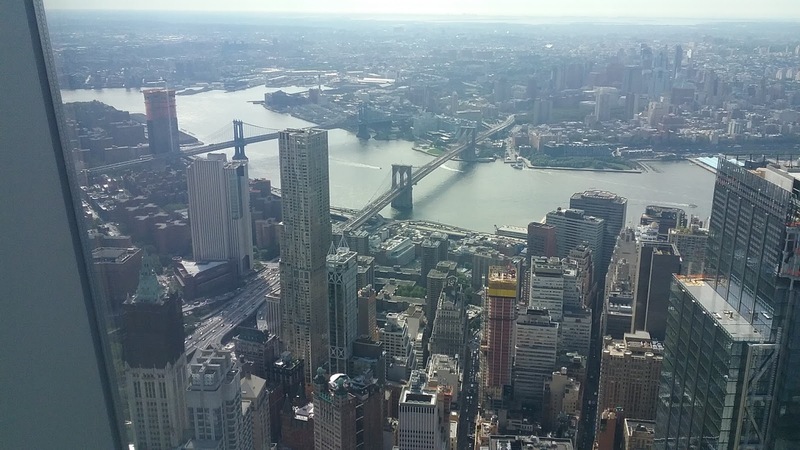 On a happier note, the One World Observatory was terrific! It's an attraction well worth the admission price. We were blessed with a clear day and we could see all over. 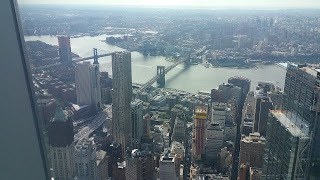 I loved how even this high up, even where big ferry boats looked like Matchbox toys, Manhattan still looked huge. It's a magnificent city, really, and this vantage point drove that home. Back on street level, it was time to set off and explore the city. 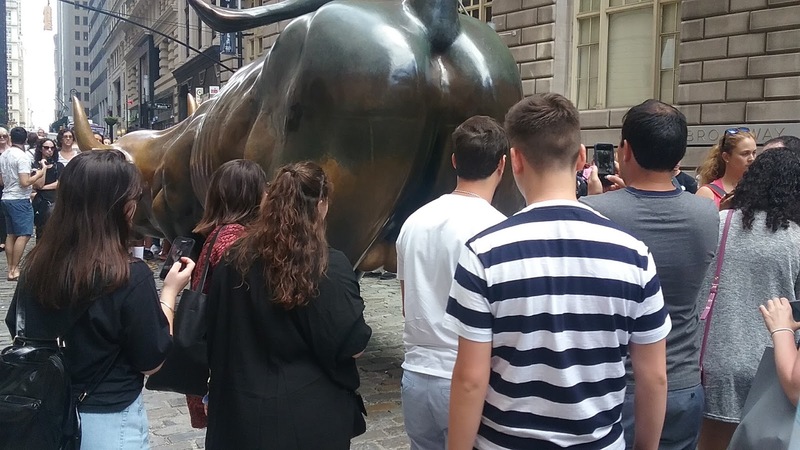 We walked east to the Federal Hall building and then the New York Stock Exchange and the Wall Street Bull statue. 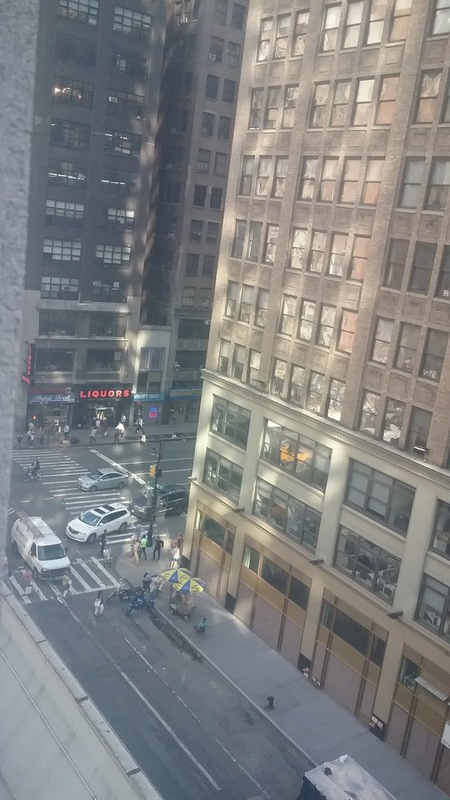 This is a very different part of the city from the Times Square area we had come from. 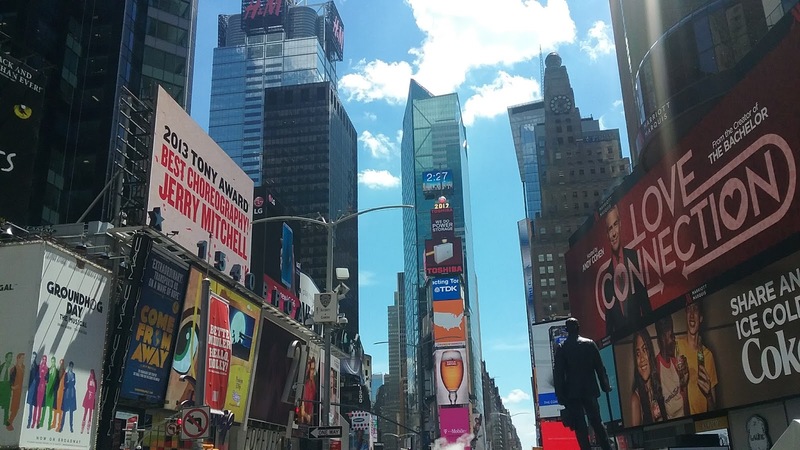 It looked to us like "classic" New York should look. Lisa at one point joked that it reminded her of the Streets of America section of facades in Hollywood Studios at Disney World. She wasn't far off. We took the obligatory statue of the bull, of course. I found it funny that despite all the hullabaloo about the Fearless Girl statue, there were a total of four people looking at her, while at the same time there was a huge crowd waiting to get a photo with the bull's raging face and at least a few dozen taking turns posing with the bull's testicles. Media reality is not the same as real reality. Ever. We were all getting a bit peckish at this point and headed off to Chinatown and Little Italy on the subway. I was only able to get us in the very general vicinity of Chinatown, so we had a bit of a walk to lunch. We ended up walking through what looked like the civic heart of the city; city hall was here as well as courthouses and a ton of municipal office buildings. 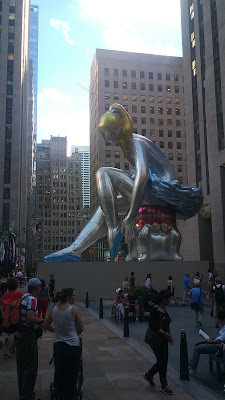 It was yet another face of New York. We cut across a park that left us off in Chinatown. This is one of my favorite parts of New York because it seems so exotic. John found it to be a bit on the sketchy side for his tastes. We had lunch in a restaurant with a huge menu of stuff we'd never seen before. I had ramen with squid and oyster sauce, John got the duck and some steamed buns and Lisa played it safe with veggie fried rice. We got silverware and noticed that Asian patrons were provided with chop sticks. No one ever asked for a preference, which was cute. While we were eating, a pair of older Italian gentlemen entered who looked like they were lifted straight out of a film, fedoras and all. Not odd, since as immersed in Asia as we were, we were only a block outside of Little Italy, our next stop. 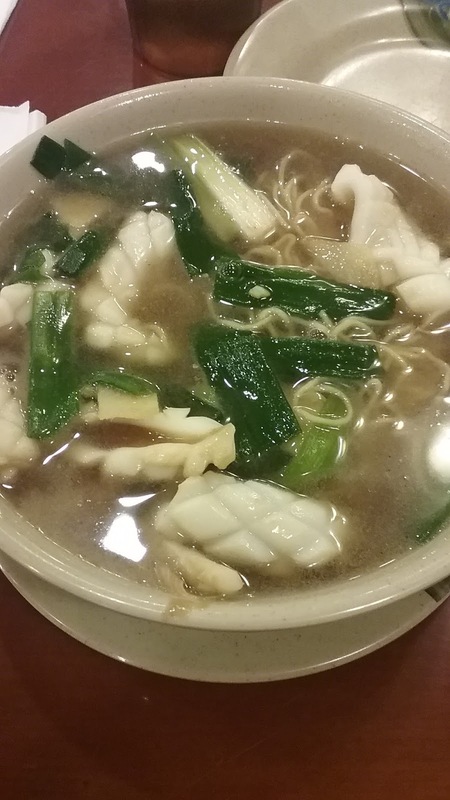 We had a tip on a fine little restaurant to try, and found it with no problem. We sat down to a second lunch (we had literally just left our first lunch about 30 minutes before) of raviolis, spaghetti carbonara and chicken pesto fusili. It was all delicious and we scarfed it down along with wine and a fine bread service. This would turn out to be a mistake on my part, as I felt like a person who had gorged himself on ramen and pasta for the rest of the afternoon. Funny thing, remember the old Italian dudes we saw in Chinatown? Well, the tables behind and next to us at the Italian place were occupied by a few dozen late high school or even college-age Asian kids accompanied by what appeared to be a mom and grandmother. 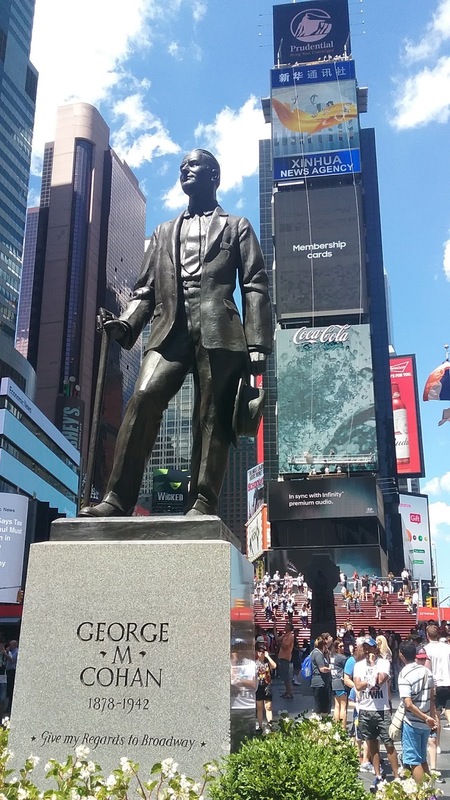 We felt that rather encapsulated New York's role as a melting pot. As we were all stuffed and a bit exhausted we decided to head back to the hotel for a Siesta. We rode the subway to Grand Central Station and walked back from there. Grand Central is truly grand. They've done a wonderful job restoring the place. 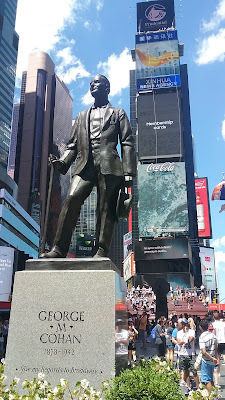 All the subway riding and multiple stairs and escalators had wreaked havoc with my sense of direction, but after asking a security guard which way was east and west, we made it to our home away from home and rested up for our night at the theatre. Kind of a lousy photo of the Phantom of the Opera set, pre-show. Our show, Phantom of the Opera was at 8 pm in the Majestic Theatre, just a few blocks away. We skipped dinner as we were still pretty stuffed from our two lunches, and walked up to the show. The Majestic Theatre is just that, majestic, inside. 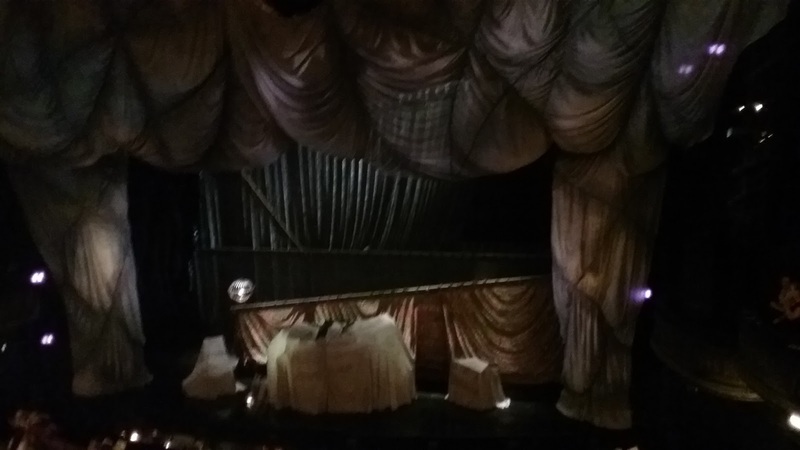 It fills all the hopes one might have for a Broadway venue and Phantom is just a classic Broadway show. We all were completely wowed by the performance and walked back with show tunes in our heads, completely fat and happy and ready for a good night's sleep. We promised John that if we didn't get him there before he graduated high school, we'd take him to New York City as a grad gift. John graduated, with honors, about a month ago, so grad gift it was. We planned this thing like a Disney trip, and I really think our experience with Disney and our mindset when going there actaully helped us in a big way while planning this trip. I really took on the Disney mindset and tried to nail down the important things, the things we needed (like lodging and transportation) and the things we REALLY wanted (like show tickets and a trip to the One World Observatory) as far in advance as we could. 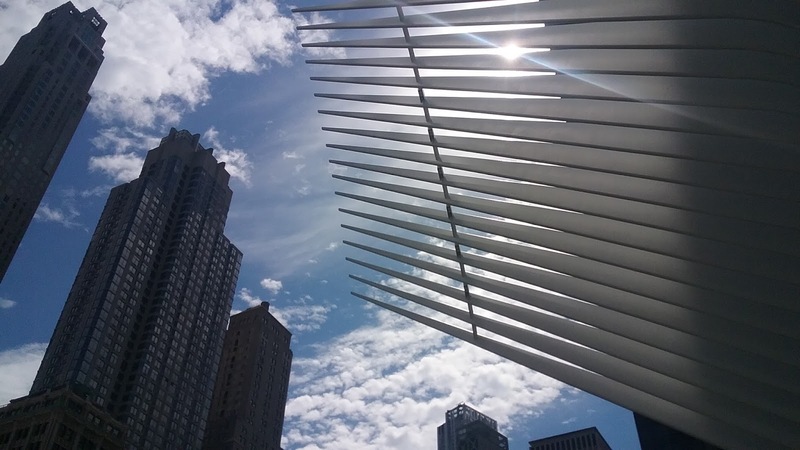 That helped not only in peace of mind but in budgeting, as some of the highest-budget items were long paid for by the time we arrived in New York. I'll stop right here and point out that the lovely and talented Lisa did her share of planning (booking the hotel and Phantom of the Opera tickets) and takinq quite a few of the photos I'll use in this blog. I can't remember who shot what and they are all mixed up on Amazon Prime Photo (do you use that? You should! ), so I'm assigning dual credit to all of them off the bat. 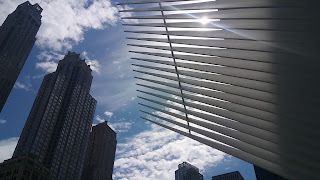 We paired our trip with a visit to my parents' house both because we wanted to see them and my sister's family and some of Lisa's nearby family and because it made NYC an easy Amtrak ride away. 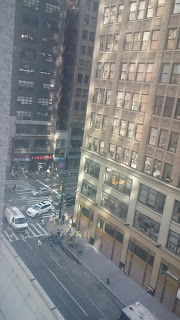 New York is like Disney in another way in that it's silly to drive a car around there. The public transportation is great, we used the subway a bunch, and the stress of driving a car along with the expense of parking it would have been too much for me. As it turns out, there is a commuter Amtrak train running several times a day from Harrisburg, PA to New York City and it stops at the Downingtown station a few minutes from my parents' house. Amtrak was great! From what I've heard, people shy away from it due to the cost, but I think the further in advance you purchase tickets the cheaper they are. I can't confirm that, but it makes sense. Our tickets were only about $220 round trip for all three of us together. Granted, that was non-rush hour times, but why would you travel then if you didn't have to anyhow? We went up on the 10:04 am train out of Downingtown and arrived at Penn Station by 12:30 pm. It was easy and hassle-free and actually kind of fun. We emerged from Penn Station into the thick of things and seeing John's face as he took it all in was priceless. We only had a few blocks to walk to get to our hotel, but it was a great introduction to a crowded city, especially with our suitcases rolling along with us. buttons and grommets), but close enough to Times Square that we really felt in the thick of things. The hotel building was funny as it only had four rooms per floor, but 80 rooms total as it was 20 stories high. We were a few hours early for check-in (and they are very specific about check-in time), so we dropped our bags with a very friendly front desk staff and set off for Times Square. We stopped for lunch in a brew pub connected to the huge bus terminal around the corner and then we were off! On the way up to Times Square I let a friend, the wonderful Alison from the awesome Disphilharpodcast, know we were in town and she arranged to sneak out of the office and meet up with us, as luck would have it, in the Times Square two-story Disney Store. We chatted, introduced all around and got some good advice about places to see and Alison's offer to be a phone-a-friend if we got lost in the big city. 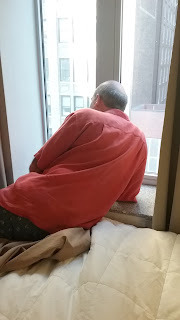 We made our way back to the Comfort Inn, checked into a room on the 8th floor that was JUST big enough to fit all thee of us inside, and set off again up Fifth Avenue towards the Rockefeller Center. 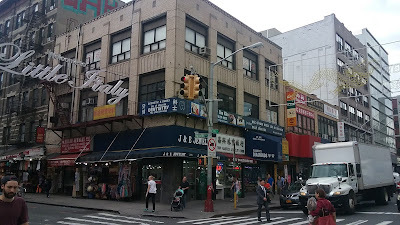 On the way, we saw more of the Garment District, which, as it turns out, is more of a pre-garment district. This is the place to buy fabric and ribbons and such, not a place to buy actual, finished garments. 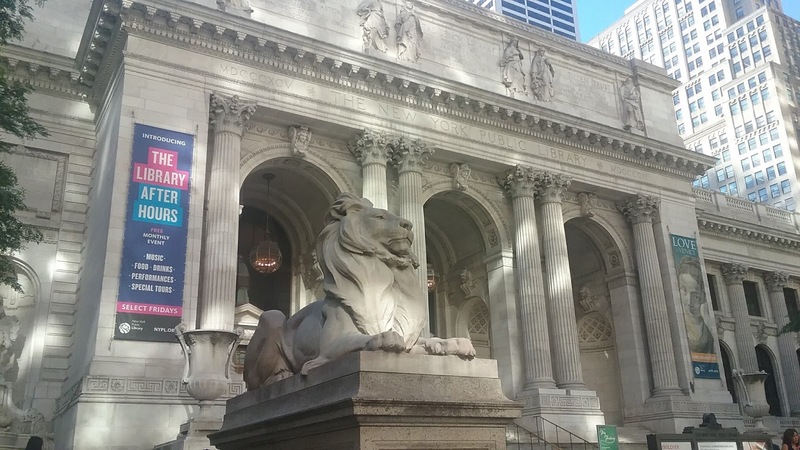 We passed the beautiful New York Public Library and began checking out some of the high-end shops until we came upon Saks Fifth Avenue and took a look inside. Lisa was in heaven, as she proclaimed, as she was among "shiny things and purses." We only looked around the first floor, feeling like gypsies in the palace, before hitting the road again and visiting St. Patrick's Cathedral. St. Patrick's is absolutely, mind-blowingly, ornately beautiful. The stone arches holding up the ceiling far above, the saints in the alcoves, the massive altar, the biggest pipe organ I've ever seen......it all blew me away. I told John he'd not see a church anything like this outside of Europe. We were all humbled by this place, and all a bit saddened by the security check on the way in. But New York post-9/11 is a different place. We'd seen police with assault rifles and shotguns in Times Square and would see the NYPD Counter-Terrorism team the next day at Ground Zero. We felt safe the entire time we were in the city, but we were very aware of the efforts to make that happen. We Love Public Art. 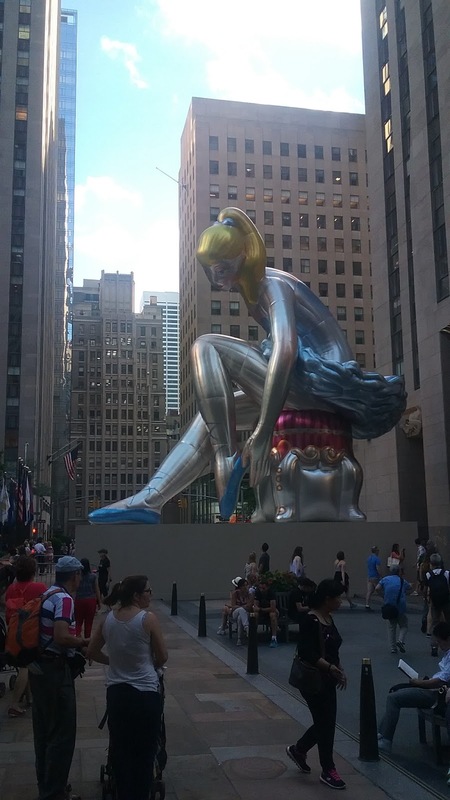 This is possibly the largest Inflatable Woman ever. Rockefeller Center was the next stop and we thought about grabbing a drink in the little outside cafe in the square, but after being seated directly under some equipment blowing hot air we wandered off. We looked around the inside of the Center but didn't even try heading up top as we were getting to be in a dinner-thinking kinda way. I might have loved looking out the window. We headed back towards the hotel by way of Times Square and spotted a Scottish restaurant and pub that looked promising until we discovered it was closed up. Luckily, there was a Cuban place across the street that turned out to be spectacular. 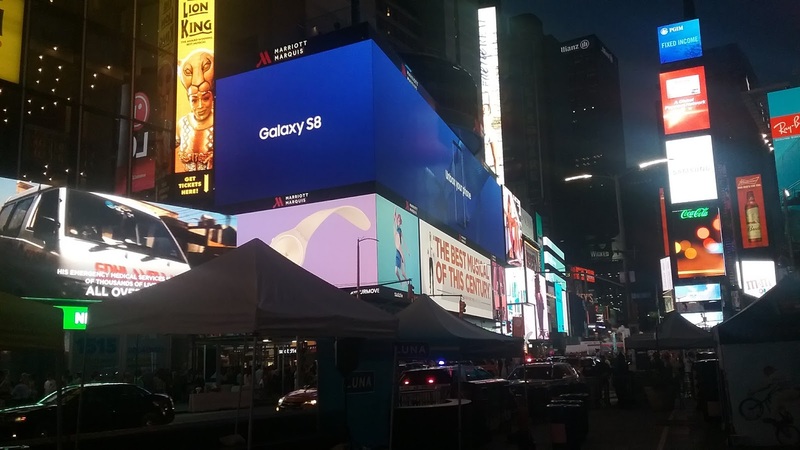 We had a delicious meal, walked though Times Square as the last of the light left the sky and the electric lights took over, and tucked ourselves into our cozy quarters to rest up for an exciting first full day in The Big Apple. Sartor Designs is now a real business!